I’ve been told that the term “dinner” is used to reference the main meal of the day. Back home in Newfoundland, that was traditionally the midday meal especially for fisherman, who had been out in boat since 4am. The evening meal was usually lighter and called supper. This carried over for most everyone, and we all called the midday meal dinner in school and elsewhere, even though for commuters, the supper meal was the bigger meal. On Sunday though, midday dinner was usually the feast meal of the week, and that feast was usually Jiggs Dinner. 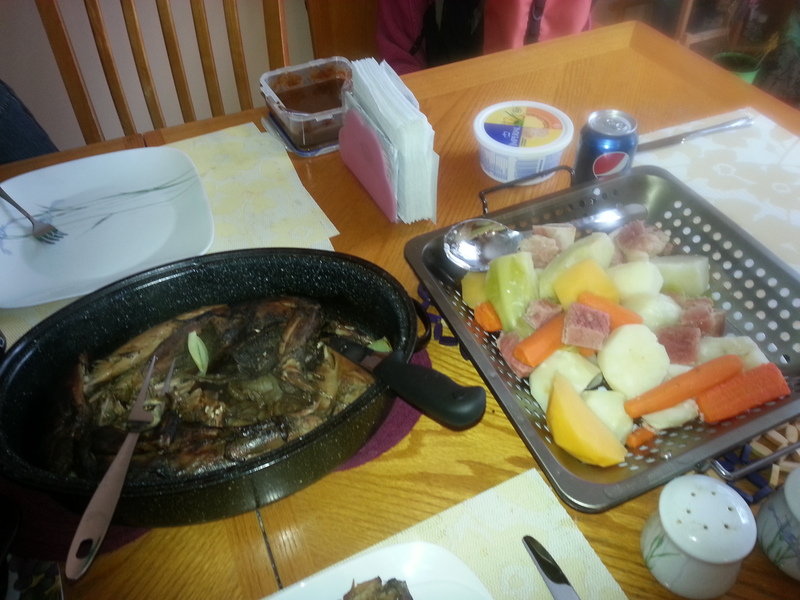 Jiggs Dinner was made up of all the traditional Newfoundland vegetables boiled up with salt beef. Salt beef sounds disgusting to some I know, but og my god, its like ambrosia for the initiated! Missing from our dinner on the left is peas pudding. Yellow peas boiled up with the rest of the vegetables in a cloth bag. I never liked the stuff, so perhaps there’s more of a secret to it than that :). 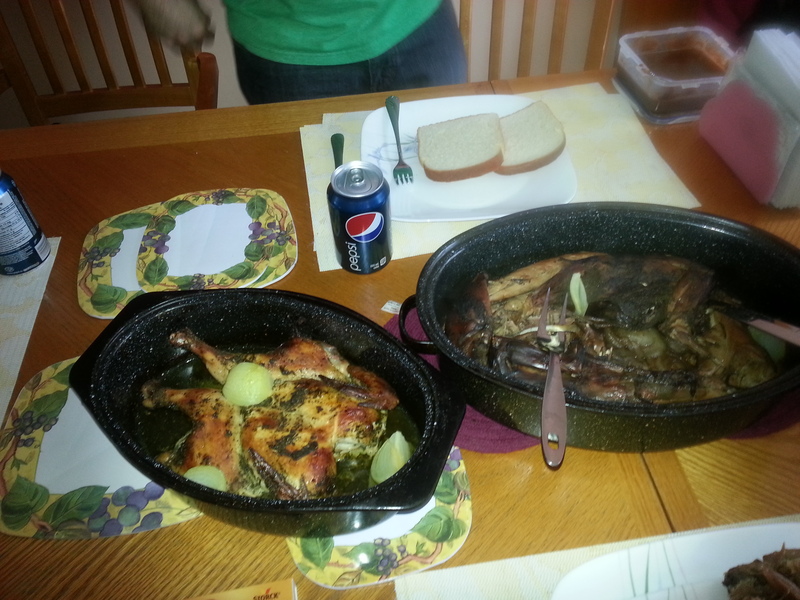 Rabbit and Chicken in the pot, lots of onions. moose, caribou, a duck or, as seen here, rabbit. Whatever the meat, traditional Newfoundland roast was smothered in onions. And the coup d’etat was the gravy. The secret to the gravy was to add some of the vegetable juice to the meat drippings, make a flour and water thickening, and of course, add the Cross and Blackwell gravy browning. After dinner, dad would likely help with the dishes, and then head off for a nap as the post meal coma would kick in. Later that evening, we’d have the left overs potato made into potato, mustard and beet salads along with pickles, beets and cold meats, and perhaps some Kam to make a cold plate for our Sunday supper. Don’t forget the fruit and jelly for dessert. Wouldn’t even consider “dinner” without peas puddih’,you kiddin’? And wouldn’t have a boil up without kippers or even better,smoked mackeral.